While I was on vacation the roses bloomed and now they are fading away. I start to move things and plant more annuals for the summer. The angel is new. I plan to move her to the big garden. 'Climbing New Dawn' is blooming beautifully. The pink flowers are falling all over the ground and it's so fragrant. A view from the patio, looking at the flower garden. I just finished cleaning the patio and now it's time to weed the flower garden. The vegetable garden is to the right and sweetheart just finished planting small plants, so there isn't much to see yet. I will surely show you the results in about 30 days. This is 'New Dawn' looking into the backyard. You can see the pergola that was built last winter. Sweetheart is installing water and electric next to the left hand post. I will have a drip system on the plants surrounding the entire pergola. I'm so excited to get started planting. I think it looks just like a Peony. No Pool at this house! 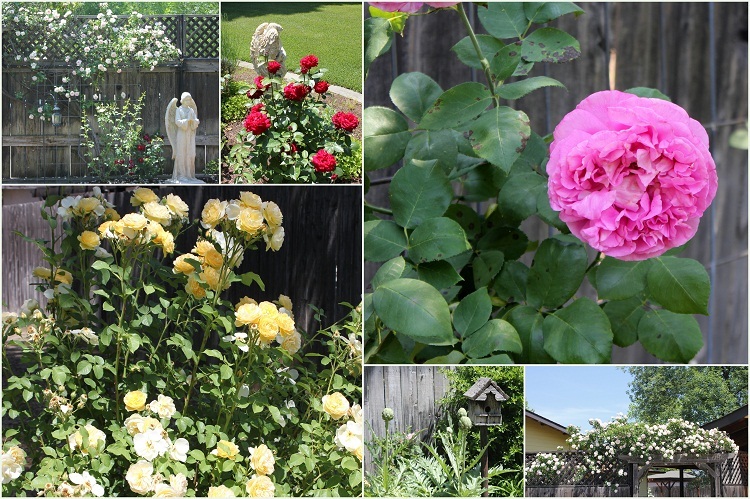 'St Patrick' is one of my favorite beautiful roses and my snow peas are to the right. YUM! 'Tiffany' rose in front of my 'Red Flame' grape vine. YUM! I hope to plant Blue Morning Glory on the wire fence next week. Yes, we have artichokes... I have a 'Therese Bugnet' rose planted behind the artichokes. Hopefully next year it will taller and more beautiful. 'Ingrid Bergman' is blooming up a storm and my angel is watching the weeds grow. I hope you have enjoyed your garden tour. I have lots of plans for the garden this year and I will be sharing more with you real soon. Please drop over and visit these awesome blogs. I love those white and green images. White and green has always been a favorite color combo of mine- indoors and out. It's so fresh and pure, clean, but earthy. I really enjoyed your garden tour. It's a lovely garden with lots of beautiful blooms. Loved your pergola too. Have a great day. I really enjoyed my garden tour! You have lots of wonderful roses and your peonies are fantastic. Enjoy all your pretty blooms. Your roses are gorgeous. Artichokes add a nice form to the garden, don't they? I don't grow them but know a woman who does and is always saying how nice they are, especially the seed heads. I love your yard! Wish I had your privacy fence. You'd done a great job landscaping. Your garden is just stunning and I LOVE that sweet angel!! I love the way you've placed your garden statuary among the plants--very pretty. And I am also a lover of David Austin roses--I grow Graham Thomas, but have trained it to be a climber, and it grows (rampantly!) up a turquoise arbor! You have a very pretty garden! Just what I needed. It was so delightful to tour your garden. You are an amazing grower. Thank you for sharing. Off to see your mother's garden. Your garden is spectacular. We live at the beach and have a tiny lot so my garden is miniscule. I just love all of your roses.